Going out to eat is a big step for young teens, especially when they get to go without an accompanying adult! A group of teens had decided to go out to a restaurant before their Homecoming dance. The only problem was that not a single one of the 13-year-old kids had any idea what to do at the end of a meal. They knew that the waiter would be expecting “a tip,” but none of them had thought to ask their parents what “a tip” actually meant. At the end of their meal, they left pocket change for the waiter and left. After the night, they realized that leaving so little change was actually incredibly rude after his wonderful service. They felt so terrible that they came together and wrote an apology and returned to the restaurant with the correct tip amount! Inside of the envelope, they included the correct amount and thanked him again. We appreciate your help and patience, and thank you for making our night fun! 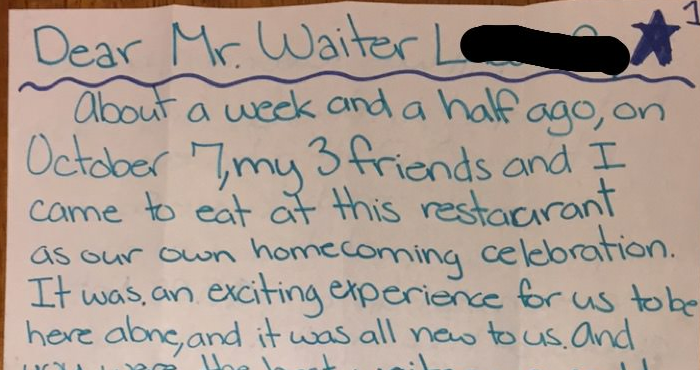 The waiter posted the letter he received from the kids and admitted that he had been frustrated the night that the kids came in, but even if he’d known that they wouldn’t tip at the end of the night, he still would have treated them the same.